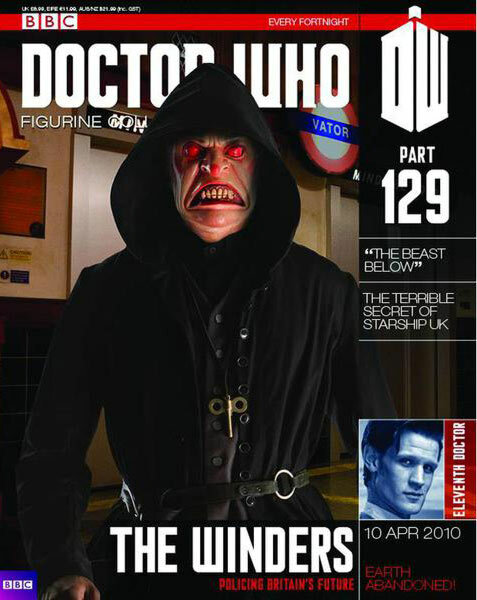 I wish they would do Leandro & the Sandmen from series nine. Why don’t they do more interesting monsters from the new series like the Moxx of Balhoun, Abzorbaloff, Commander Skorr etc.? I’m not that keen on dull characters. Would’ve preferred them to of done a Smiler instead. So would I. Neil Corry said it could happen. Yeah this unnecessary and obnoxious tagline thing next to the figurine’s name is kind of getting on my nerves now. Doesn’t fit with the rest of the collection at all. I agree. It’s silly and doesn’t fit in. When are we going to see an axon monster? They will come. They asked in Twitter a few months back how people would like them to do their Sutekh figurine – masked or unmasked – so he’ll arrive sooner or later. I’d think Green is a good likelihood too. But if l was them, I’d deliberately pace out the ‘big hitters’ characters to keep people in across the full 180 issues (or more if it gets extended again). Makes better business sense to drip feed them amongst the more obscure characters and throw us a bone every now and then. (From what I saw on Twitter, the majority wanted Sutekh to come with his iconic red/black mask on, rather than with the jackal head). My interest is in the collection is quickly decreasing. That’s not a slam against the figurines, I just feel as though some of the more recent ones are a bit dull. for example this one has a CO counterpart and it’s just generally not an interesting story. It has its moments. The smilers/ winders emerging out of their booths and chasing our protagonists and poor timmy trapped in the disposable lift are worthy of a mention.